Congratulations to Rowena Hawtin who has successfully progressed through to the South-East District speech competition, having been awarded second place at the Kent Area competition on 11th February. Welcome to Lee Hayward, pictured here being presented with her Guide by Monty Knight-Olds. Leigh is the latest member of West Kent Speakers’ Club and we look forward to hearing you progress through the Guide. 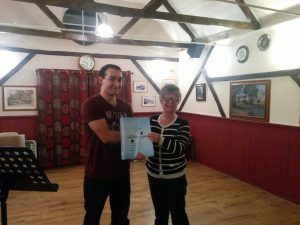 Welcome to Alvin, the latest member of West Kent Speakers’ Club. The Kent Area competitions, which took place at the Hilton Hotel in Maidstone on Sunday 19th February, were dominated by speakers from West Kent. Consisting of a topics (impromptu speaking) competition, an evaluation competition and speech contest, the results of the day saw Sue Shaw win the topics contest and come runner up in the evaluation and speech competitions, with Aly Harrold winning the speech contest. 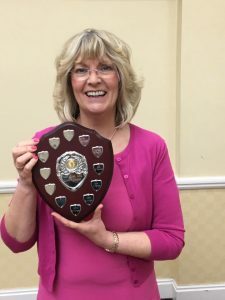 This is the second time Aly has been crowned Kent Speaker and both her and Sue will go forward to the District competitions in a month’s time. Sue Shaw and Ravi Kalsi were also jointly presented with the Kent Area President’s Cup for their contribution to the Association of Speakers’ Clubs (ASC). Welcome to Jack Simms, the latest member of West Kent Speakers’ Club, who joined after his first visit to find out more about the club. 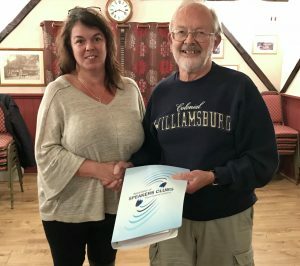 Congratulations to Susan Shaw who received her Advanced Certificate from Chris Frost, the President of West Kent Speakers’ Club. Sue, as past President of the Club and finalist at the ASC national speech competitions, joined West Kent Speakers’ Club in 2009 to help with her floral demonstrations. Since then, she has qualified as a National Speaker for NAFAS and is on the Kent Area list as a demonstrator, judge and teacher. West Kent Speakers’ Club enjoyed success at the Kent Area competitions, with Aly Harrold securing a second place in the speech competition. The competition took place at the Early Bird on 7th February with the other Kent clubs – Thanet and Chaucer Speakers’ Club – battling it out for places at the District competition on 20th March. Those that are successful at the area competition will go forward for the national competitions in Aberdeen on 22nd April. 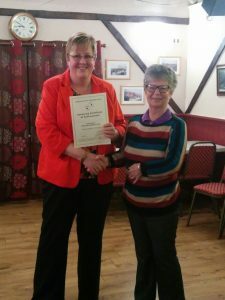 Aly has previously enjoyed success at the national competition, with a third place for her speech in 2014, and last year Sue Shaw also gained a third place at the competition. In addition to Aly, Michael Breeze gained a second place in the evaluation competition and both Jackie and Rowena performed well for their first times. 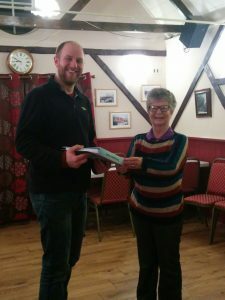 Neil Lakeland, a member since 2010, successfully completed his A10 Showpiece speech at the meeting on 27th January 2016. His speech, which looked at careers advice and guidance and how people get into the careers that they ultimately pursue, was evaluated by Terry Nunn and Will Warren – the current ASC National President and a member of Chaucer Speakers’ Club. By completing all 10 set speeches, Neil will gain his Certificate of Achievement and progress onto the advanced section of the guide. Our annual barbecue, now an established West Kent Speakers’ Club social event, which was hosted by Chris Frost, successfully raised £76.00 for a local hospice. Thank you to all members and family/friends who attended, and especially to Chris Frost for her hospitality.